Continuous Education On the Job, In the Classroom | KLH Industries Inc.
To encourage employees to take their own initiative in continuous education, KLH also offers partial tuition reimbursement for all employees - whether a first-year apprenticeship student or seasoned CNC technician. Noteworthy, however, is that KLH only reimburses for satisfactory grades: 3.0 or better on a 4.0 scale. By complying with these requirements, an aspiring machinist can graduate with a degree in Metal Fabrication, while passing nearly one-third of their tuition fees onto KLH. Although it is difficult for a small business to make a financial commitment to workforce development, KLH believes it is an absolutely integral part of company growth. For example, KLH spent over $300,000 in company-wide lean training. Each employee received a minimum of 80 hours of Lean training, although some employees received an additional 40 hours of “Lean Leader” training. KLH not only covered tuition cost for all employees, but also paid employees their usual wages during these training hours, which ran in excess of 2,300 hours. KLH's most valuable resource is our employees. "It seems like a hefty price tag at first," explains Operations Manager Joe Mingari, "but we wanted to build a corporate culture around Lean principals. You won't get employee buy-in by standing on a soapbox all day. [Lean training] is working. Every person in this building could tell you how 5S changed their daily activities." Even President/CEO Kenneth Heins is not exempt from the expectation of continuous education. 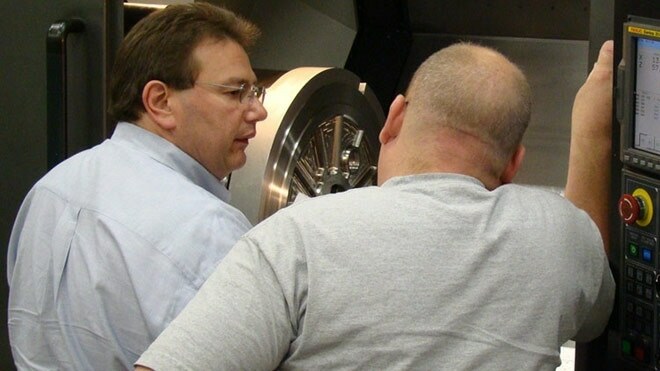 In 2009, Heins committed to over 150 hours of classroom education in subjects such as: Six-Sigma Management - Green Belt, CMM Inspection, and Geometric Dimensioning & Tolerance. Despite over 35 years in the industry, he is proof that old dogs can learn new tricks. Continuous improvement is only possible with a workforce that embraces change. Before a customer can buy from KLH, an employee must buy into KLH. "Our secret is no secret," says Heins, "KLH’s most valuable resource is our employees."